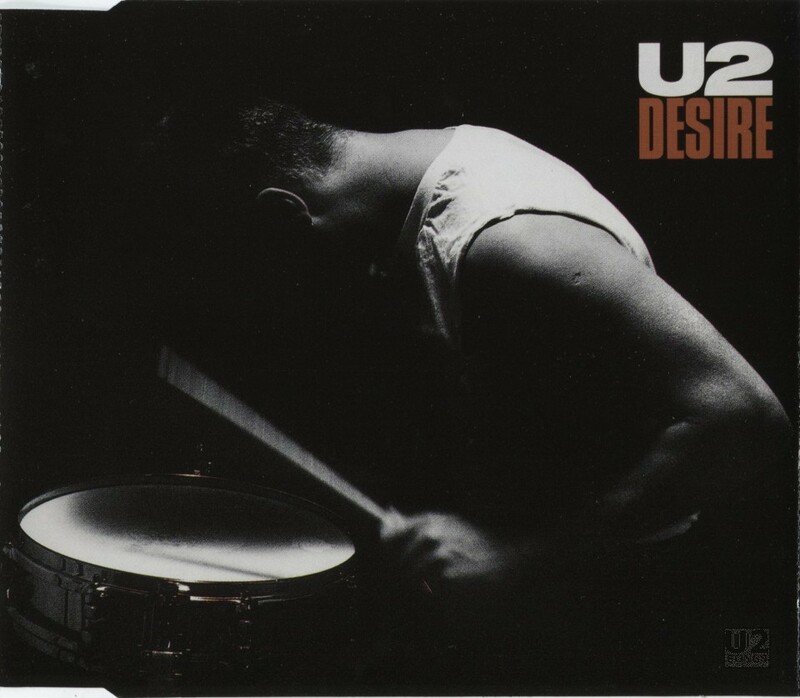 “Desire” was the first single to be released from the album Rattle and Hum, U2’s soundtrack to their documentary/concert film of the same name. The song gave U2 their first #1 in the UK charts, and made a strong impression on charts worldwide, as well. The album version of “Desire” was recorded at STS Studios in Dublin, although early footage of the band working on the song at Point Depot can be seen in the Rattle and Hum movie. The song was produced by Jimmy Iovine, who had previously worked with the band on Under a Blood Red Sky. The front of the single sleeve features a black-and-white photo of Larry Mullen drumming. The same image was used on all commercial formats. The back cover photo, taken from the beginning of the Rattle and Hum film, depicts U2 onstage, silhouetted against the red background of “Where the Streets Have No Name.” The 7-inch vinyl, cassette and 3-inch CD formats of the single included the album version of “Desire” backed with a new non-album track, “Hallelujah, Here She Comes.” The 12-inch vinyl and 5-inch CD added a third track, “Desire (Hollywood Remix),” remixed by Louil Silas Junior and Taavi Mote. This mix, running 5:23, is an edit of a longer 9:23 remix, which only appeared on some promotional singles. A video for “Desire,” directed by Richard Lowenstein and produced by Michael Hamlyn and Juliet Naylor, was released in three different versions, all of which feature footage from Los Angeles. The first version, set to the album mix of “Desire” with some added siren sounds at the start of the track, features images of the band around Los Angeles intercut with black-and-white footage of them playing in-studio. Bono can be seen on the roof of the Rosslyn Hotel. Much of the Los Angeles footage, including some excerpts from local newscasts, does not involve members of the band. This version of the video was included on the compilations The Best of 1980-1990 and U218 Videos. A second edit of the video is identical to the first, with the exception of the brief appearance of a naked woman. The third version of the video is set to “Desire (Hollywood Remix),” and includes loops of some of the original footage to account for the longer running time of the remix. In addition to these variations of the Lowenstein video, U2 can also be seen performing “Desire” in the movie Rattle and Hum at the Point Depot in Dublin. The scene is filmed in black-and-white, and features U2 playing a rough version of the song, including some alternate lyrics. This footage can be found on home video releases of Rattle and Hum. “Desire” debuted live in concert during The LoveTown Tour in 1989, and was performed at most shows. It was played at most of the shows on The Zoo TV Tour, as well. It was dropped from the set for the majority of The PopMart Tour, with only 12 performances on that entire trek. “Desire” made appearances at less than half of the shows on 2001’s Elevation Tour, most of those coming during the first and second legs, plus two performances on the final leg. On The Vertigo Tour the song was only performed six times, primarily at stops in Australia. On The U2360° Tour, “Desire” appeared a few times during the first leg and at two shows later in the tour, for a total of only nine performances. During 2015’s Innocence and Experience Tour “Desire” was performed at 38% of the shows. Live versions have been released in audio format on the Love: Live from the Point Depot (Dublin, December 31, 1989) album, part of the iTunes-only The Complete U2, and the fan club album Go Home: Live from Slane Castle Ireland (Dublin, September 1, 2001). Live performances have also been released in video on PopMart Live from Mexico City (Mexico City, December 1997); Elevation 2001: Live from Boston (Boston, MA, June 6, 2001); and U2 Go Home: Live from Slane Castle (Dublin Ireland, September 1, 2001). A performance from Yankee Stadium in New York on August 30, 1992 was used as a bonus track on the DVD release of Zoo TV: Live from Sydney, but does not appear on the VHS or audio releases of that set. In 2011, members of the U2 Fan Club were given the opportunity to vote on 46 live tracks recorded during The U2360° Tour, with the top 22 songs to be included on a live album, U22. “Desire” was one of these choices. In the end, however, the song did not receive enough votes to appear on the final live compilation. The following year, the Edge picked his favorite tracks from the remaining 46 live tracks, and once again the track was not chosen for inclusion on From the Ground Up: Edge’s Picks. The December 19, 2010 version recorded in Perth Australia, however, was released as a bonus digital download. “Hallelujah, Here She Comes” has never been performed live. “Desire” has featured on a number of compilations, including U218 Singles and The Best of 1980-1990 and related releases. It was also featured on the “Previously,” “WFM 96.9,” “Previous Day,” “Brit Awards 1989 Sampler,” and “Rock and Roll Hall of Fame Induction Ceremony” promotional releases. “Desire (Hollywood Remix)” featured on the “God Part II” and “3D Dance Mixes” promotional releases. “Hallelujah, Here She Comes” was included on The Best of 1980-1990 & B-Sides compilation and associated promotional releases. It also featured on the “God Part II” promo, although it was incorrectly labeled as “Hallelujah, Here She Comes (Hollywood Remix),” when it is, in fact, the same version found on the “Desire” single. Desire: Written by U2. Produced by Jimmy Iovine. Recorded by Paul Barrett at STS Studios, Dublin. Mixed by Shelly Yakus. Hallelujah (Here She Comes): Written by U2. Produced by Jimmy Iovine. Engineered and mixed by Dave Tickle and Mark DeSisto. Special thanks to Billy Preston for additional vocals and Hammond Organ. Desire (Hollywood Remix): Produced by Jimmy Iovine. Remix production by Louil Silas Junior and Taavi Mote. Remix Engineer: Taavi Mote. Assistant Engineer: Andy Batwinas. Additional production and Programming: Jeff Lorber. Backing vocals: Alexandra Brown and Edna Wright. Remixed at Larrabee Sound. Photographed by Anton Corbijn. Back cover photography by BIll Rubenstein. Designed by DZM, The Design Group. Based on an idea by Steve Averill, Works Associates.